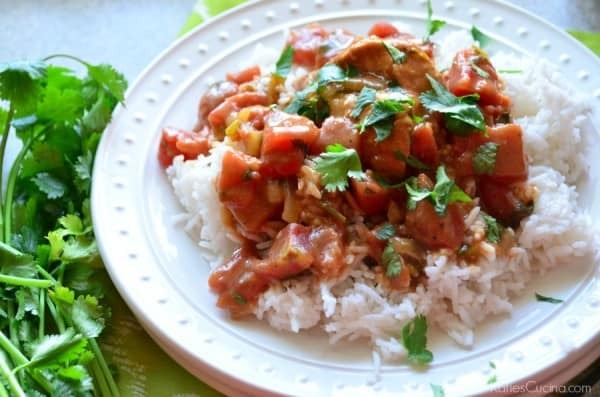 Make this slow cooker chicken tikka masala in the comforts of your own home. It’s a home-takeout family favorite full of lots of flavor! My husbands Birthday is tomorrow. Eek! I’ve invited his entire family over for dinner and included a few of our closest friends. 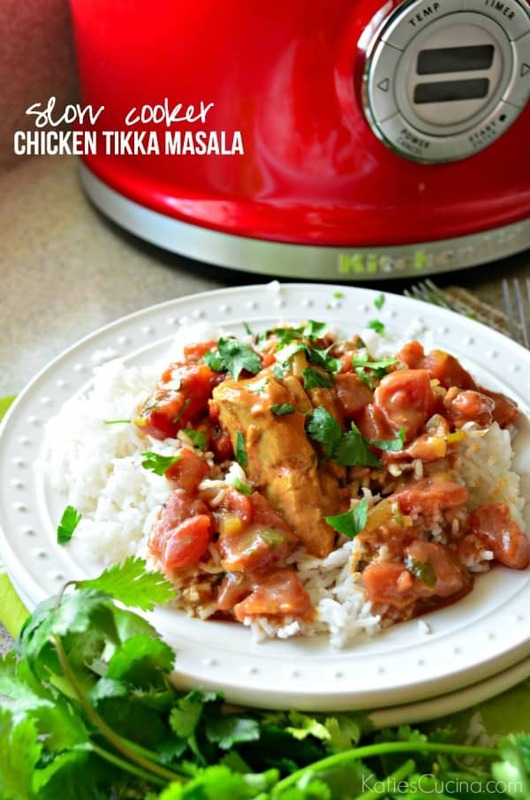 I really wanted to make this Slow Cooker Chicken Tikka Masala for dinner tomorrow night, but we have some picky eaters attending. So instead I’ve opted for tacos. Everyone loves a taco. But throw in Indian food and some people just aren’t ready to make the jump. If you are ready to try something new (or if you simply love Indian food), get ready to give your taste buds a treat. Bringing Indian food into your kitchen is so easy to do thanks to this recipe. 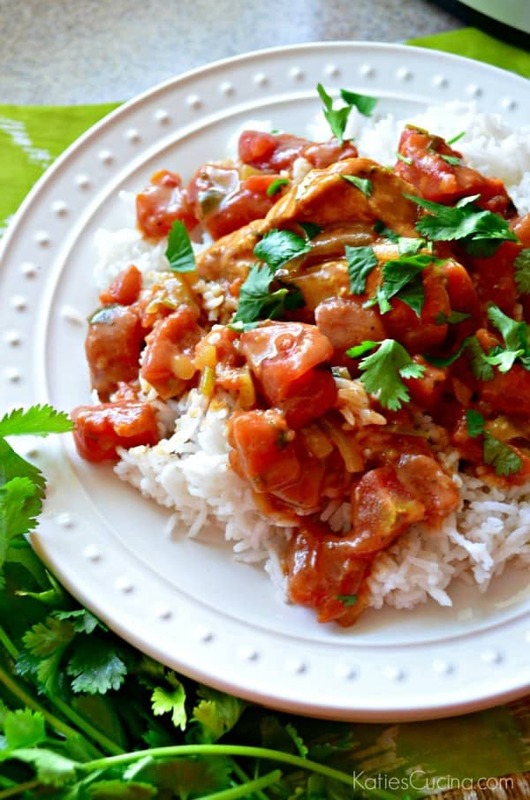 Slow cooker meals can tend to be bland, flavorless, and dried out. They tend to get a bad rap, but I promise there are awesome slow cooker recipes out there. 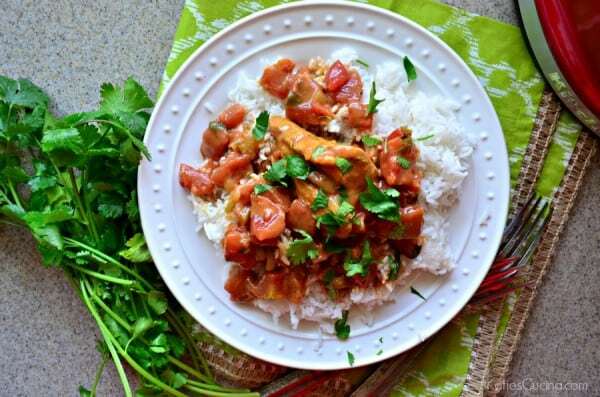 And this recipe for slow cooker chicken tikka masala is anything but flavorless. I tend to stay away from slow cooker recipes with a lot of ingredients; however, I was intrigued to try this recipe. The original recipe from Cooking Light calls for bone-in chicken thighs. I’m not a fan of dark meat, so I took a gamble and used boneless chicken breast. We found that by keeping lots of sauce on the table and adding sauce once we cut our chicken into bite-size pieces that the chicken was perfect. If you don’t add the sauce after cutting the chicken it definitely can lack flavor and taste a little dry. So if you’re like me you can use chicken breast. If you like dark meat go on and make the chicken thighs! I used my KitchenAid Multi-Cooker to cook this meal. Since I knew I would need to simmer the sauce before adding the chicken and turn the slow cooker on this was the easier less messier route for me to go. I absolutely love all the funcitions that my Multi-Cooker can do. So if you don’t have a Multi-Cooker don’t worry you can execute step 1 in a large pot on the stovetop then transfer to a slow cooker. I also added in a little extra curry powder and graham masala before serving. The sauce is good but adding a little more spice at the end freshens it up! Oh and lots of fresh cilantro! So so good! We added a dollop of Stonyfield Greek yogurt on top of the chicken and served it with basmati rice and baked naan. You could also add in this cucumber tomato salad recipe if you want some fresh veggies in the meal! Many grocery stores now sell naan making it easily accessible to everyone now. I bake it in the oven for a few minutes because I find that I like it warm. 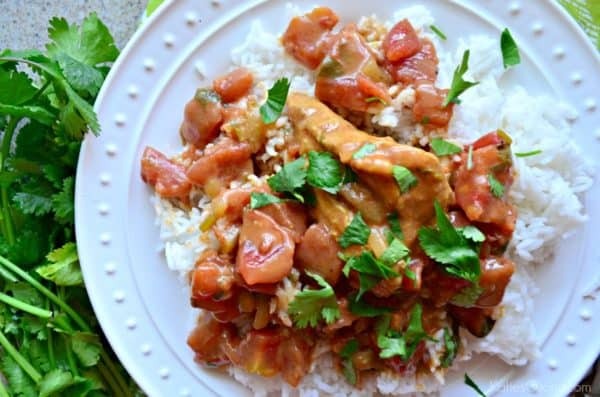 So if your craving Indian food and don’t want to go out to eat–you can make this slow cooker chicken tikka masala in the comforts if your own home! Easy as Pie… Chicken Pot Pie!